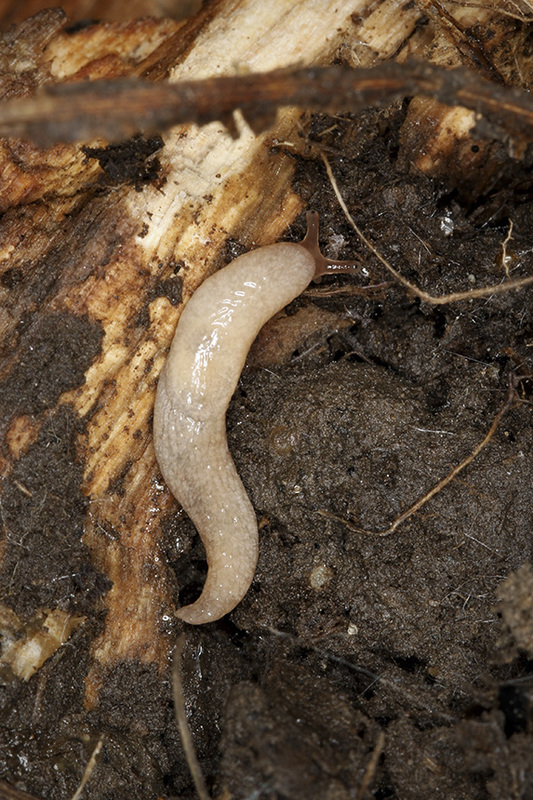 Gray field slug (Deroceras reticulatum), also known as milky slug, is a common, exotic, terrestrial, smooth land slug. It is native to northern Europe, North Africa, and the Atlantic islands. It was introduced into North America and now occurs across the continent. It is most common in southern Canada and northern United States. It can be a serious crop pest, but is not listed as invasive nationally or in Minnesota. It is usually found above ground but under stones or leaf litter in open areas, especially cultivated areas. Gray field slug is stout, 1⅜″ to 2″ long and white, cream, gray, or tan. When at rest, the body is contracted and the tentacles are retracted. When traveling, the body is stretched out, the tentacles are extended, and it exudes a clear mucus. When disturbed, it exudes white mucus over its entire body, leading to one of its common names, milky slug. This entry was posted in Uncategorized and tagged Deroceras reticulatum, gray field slug on January 16, 2019 by John Valo.